Lots of bicycles in Beijing. Special lane for bicycles on many roads. Don’t get me wrong, plenty of cars and busses too — just with 13 million people, some people need to ride bikes to get around. The park was fantastic. Here’s a picture from a movie I took. (I’ll post the movie below.) 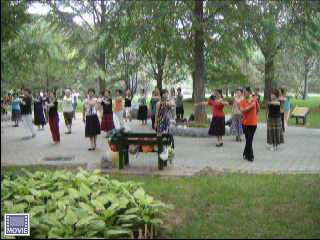 These women were dancing in the park to recorded music. Nice form of exercise and community involvement. Plenty of stuff for the kids. There was even a little amusement park with rides. I’m running out of time. I’ll post some more photos without any text.